With spring comes … bunnies, and … carrots. With spring also comes carrot cake. And this carrot cake was such a delight to make because it turned out great the first time I adapted it. Even my chocoholic hubby came back for more. It’s light and fresh, just like spring, and its filled with good-for-you ingredients. If you don’t add the glaze it’s even refined-sugar free. The first step in adapting this recipe for high altitude was to find a slightly smaller pan size to avoid a crater in the middle of my cake. The sparkling water was already in the ingredients as the egg substitute, and it helped keep the cake from crashing in the center. Next, I sifted the dry ingredients to incorporate more air and loft. Last, I reduced the baking soda. All of these actions made for a lighter than air cake which made me so happy as I had feared the carrots would weigh everything down. Preheat oven to 350 F and lightly grease a 10×10” pan. 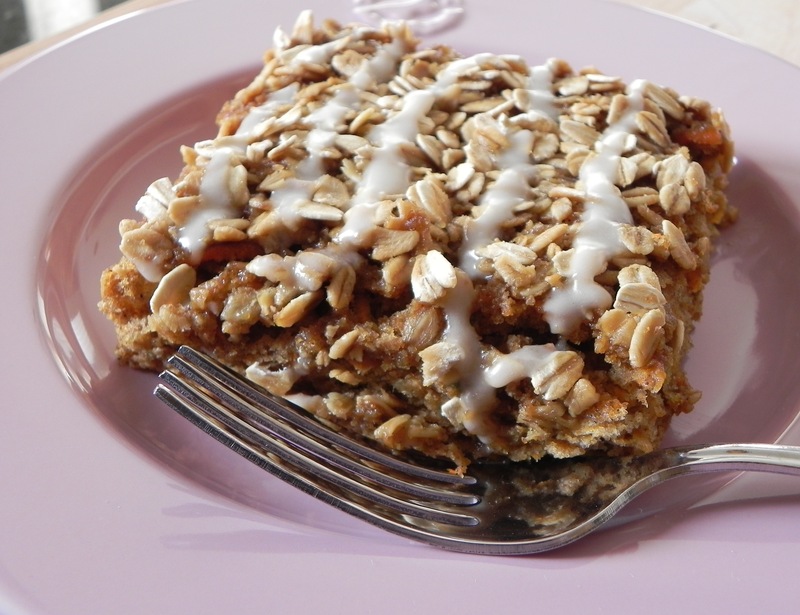 In a bowl combine brown sugar and oats for the topping. In a large bowl sift together flours, baking soda, baking powder, cinnamon, nutmeg and salt. Place carrots and orange zest on top of dry ingredients in bowl. In another bowl whisk together milk, maple syrup, vanilla and oil. Mix in sparkling water. Gently fold wet ingredients into dry and mix until well combined. Transfer mixture to baking pan and spread evenly in pan. Sprinkle topping over surface of the batter. Bake for 26 to 28 minutes or until a toothpick inserted in the center comes out clean. For the icing, mix together powdered sugar and milk until well combined. When cake has cooled, drizzle glaze over cake. Store in an airtight container in the refrigerator. When I first moved to altitude I didn’t start baking immediately. I didn’t know I needed to until I sampled a fair amount of (awful) local cookies and cakes. That made me realize that if I wanted vegan treats with good taste and texture, then I had to make them myself. And I had to figure out how. My first research source was Colorado State University. I requested their booklets on recipes for high altitude. Granted, these titles didn’t have the word “vegan” in them, but I figured I’d take one step at a time. Back then I only concerned myself with “dairy-free” and there were plenty of substitutes for dairy items. So, manned with my substitutes, I started baking for high altitude. The immediate problem with the booklets is that the recipes called for shortening and all white flour. These weren’t the healthier ingredients I was hoping for, but I thought I could adapt things. Of course, when I substituted whole wheat flour in some baked goods they got too heavy. Add to that the density of dairy-free margarine and I encountered a few problems. So, what to do? The next step was to find good vegan recipes and use some high-altitude tips. Oddly enough this worked better for me than making a high altitude recipe vegan. Even though I was examining baking science, I found that the lack of egg or butter made some high altitude treats unappealing. As I take on the next venture of adding gluten-free to my bag of baking tricks, I find myself at a crossroads again. 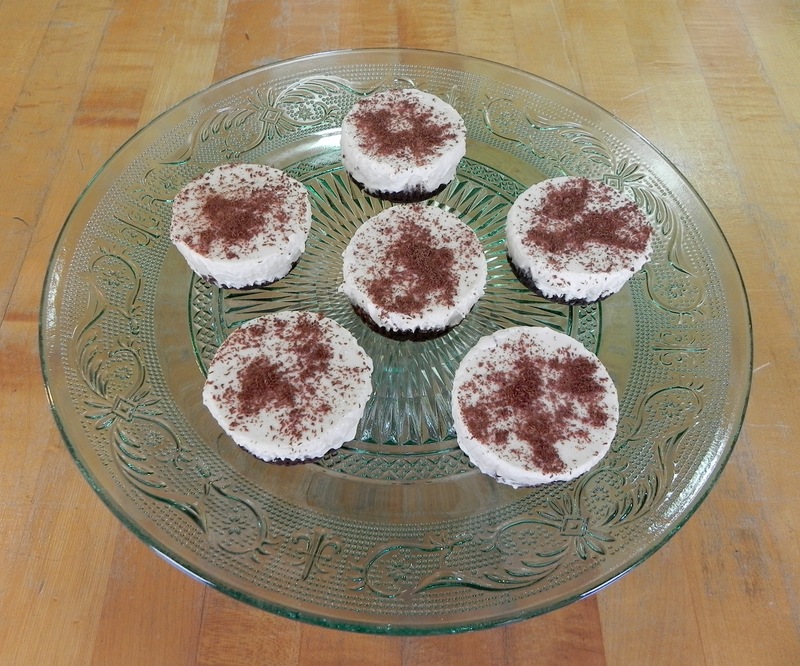 I have made gluten-free treats but found I couldn’t adapt the recipes to high altitude without massive failure. So I turned back to those pamphlets from the University and discovered one I forgot about entitled “Wheat, Gluten, Egg and Milk-Free Recipes.” Upon reading the brochure I saw a tip that recommended baking at lower temperatures for longer times when making products that are without gluten, milk and eggs. 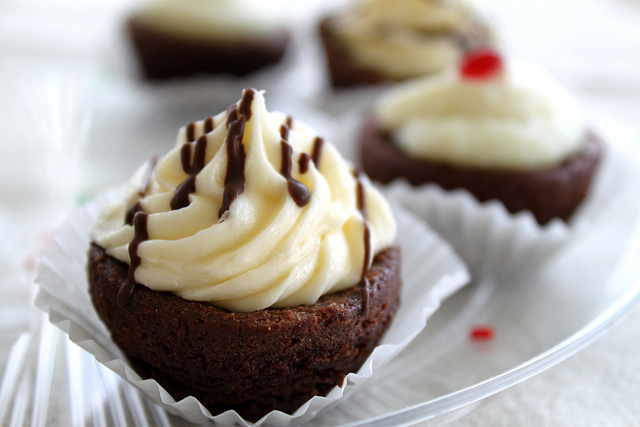 They also mention that low-gluten items get improved texture if they are refrigerated before baking. Armed with my new hints for successful high-altitude, gluten-free and vegan baking, I run enthusiastically back into the kitchen. Who knows? I may get it right someday. This blog is the record of my baking experiments. My journey has been to find vegan substitutions, to make recipes work at high altitudes, and, lately, to attempt the world of gluten-free. Along the way I have amassed a cupboard full of new baking ingredients to add to my arsenal of tried-and-true favorites. Sometimes I buy a bagful of something and only use a pinch, so I needed to discover the best way to store everything. For most pantry staples, their enemy is light and air. 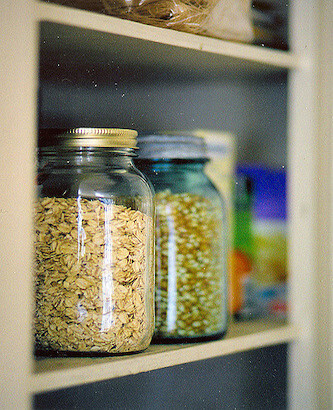 Storage in airtight containers will help keep items fresh and lasting longer. Dried fruit, leaveners, spices, and whole grains stored this way are fine in the cupboard. An important note: DO NOT store spices on the counter near the stove as heat and light will destroy them quickly. Another consideration is temperature. Nuts and seeds have oils in them that will go rancid so they like it very cool if not freezing. The Ideal storage for nuts and seeds is in tightly sealed containers in the refrigerator. I usually take nuts and transfer them to zipper bags before I put them in the fridge. I have also learned to move them to the freezer if I won’t be using them up within a month. For items stored at room temperature, I put them in glass jars if I have the space. When room in the pantry runs low, I transfer goods to zipper bags and then place all of those bags in a plastic bin and put it somewhere cooler, like in the basement. They are then protected not only from heat but also from bugs and rodents. Now, when I need an esoteric flour for a gluten-free baking attempt, I can bring the bin into the kitchen to browse my collection and know that the items are fresh and critter-free. No one wants critters in their baking, especially when it’s vegan.